The second of three Mega Man X series prototypes I'm dropping this month is here. 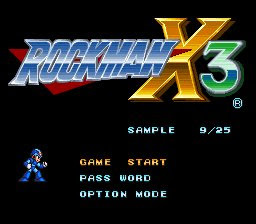 Tonight we've got another sample version of Rockman X3. The build date on this one is September 25th, 1995 – that's three months before the game hit retail (December 1st, 1995). It's the least interesting of the three prototypes I'm tossing up (find out what next week's is after the jump) but nevertheless it's an important piece of X3's development history. You can download this prototype (and lots of other prototypes, sample versions, etc.) from the green "Betas & Protos" button on the right side of the blog. 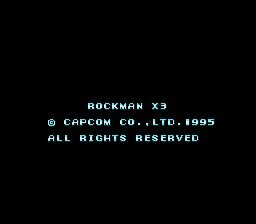 The file is "ROCKMAN X3.sfc". This build is much closer to the final release. Some debug functions are still present, such as the commands to reset the game, freeze frame, clean pause, and slow motion. A sound effect plays when the invincibility command from the August 9th build is entered, but you don't actually become invincible. Other than that, the differences here are really minimal. The "ALL RIGHTS RESERVED" text displayed at boot up is missing a period and X and Zero are positioned differently during the cast roll sequence at the end of the game. There could still be other small differences or bugs somewhere, but they aren't currently known for certain. Obtaining the cart and dumping the ROM: TX D.
Next week's third and final prototype of July is... Rockman X2! It has several differences from the final game. Nothing too earth shattering but still very, very cool. Look forward to it! Thank you so much!.. It is 2nd prototype version. Awesome. Can't wait for the third and finally prototype. Cheers! Good job! Might not be as different but every beta is important and appreciated, thank you! :) X2 is super exciting, has there ever even been early magazine screenshots or promo videos showing different stuff in X2? I can't recall any, so anything different about X2 is brand new, at least to me. Brian you're the man for sharing these with us. Thank you! X2 may be my least favourite of the original trilogy, but I would love to see how different it was in its earlier stages, and if that 4th female X Hunter is in the coming proto. After all, ehen you said a proto that's gonna be a big deal (albeit not X1 white city-big), I am stoked all around. The third prototype version you will release this month is beforeor after the Aug 9th version? There is released prototype versions from X1 and X2? 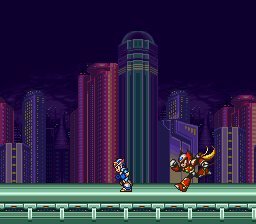 I wonder, will the holy grail of all Mega Man X prototype, the "White City" from NP screenshots,ever be found? Do you think it's out there Protodude, or was the White City never actually part of the game, just a mockup by Capcom?